I was probably 12. It was a weekend and I was playing with my friends at the neighborhood park. We were at the drinking fountain filling up water balloons and messing around. I remember looking down the street and watching a man walk at a brisk pace towards us. I knew he was coming to confront us. He looked really angry but I didn’t move from my position at the drinking fountain. No, I wasn’t being brave, I just didn’t know what else to do. I had three friends with me but I was the one at the fountain with an empty water balloon in my hand. This adult grabbed the balloon out of my hand, threw it down, and started screaming at me. Literally screaming. One of his daughters supposedly told him that she had been sprayed with water and this guy was out for blood. It didn’t matter that I had nothing to do with the incident or even knew anything about it (neighborhood kids had water fights at the park every day). I looked the guy straight in the eye and took it. Two inches from my face, this grown man intimidated me and threatened me. It was an uncomfortable situation. Now don’t get me wrong, I grew up getting yelled at. But it was in a controlled situation and I knew the people, usually coaches, who were chewing me out. They were trying to make me better, this guy was trying to humiliate and scare me. Last week, the confrontation at the Lincoln Memorial between a few different groups was shown over and over on cable news. One party was quickly blamed for the altercation but as more information came out, an entirely different story emerged. I wanted to withhold writing about it until the facts came to light. The context of this encounter was initially botched. 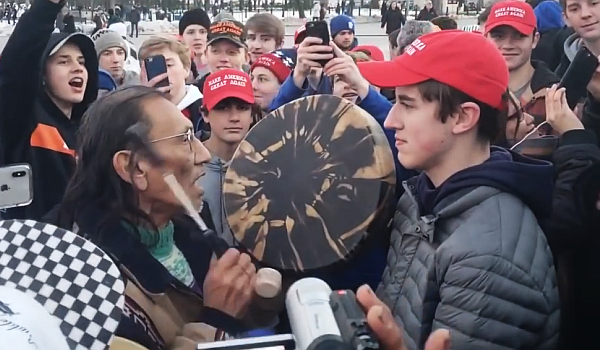 Because of a tweet that took 30 seconds of video and framed it as “Trump-supporting Catholic school snobs surrounding and mocking a Native American elder,” students from Covington High School were unmercifully and unfairly condemned by society. These kids had bounties placed above their heads as social media users, including celebrities, encouraged harm upon them. They were doxed and their school had to be shut down. The students were directly contacted by nuts threatening them in all sorts of ways. The truth has since come to light. The man with the drum approached the students, contrary to the narrative that said the kids ambushed him. But this wasn’t the inaccuracy surrounding the first couple days of reporting that bothered me the most. Rather, it was what the boys were subjected to before Nick Sandmann and Nathan Phillips were face-to-face that should make all of us demand better. As the Covington students were walking to their bus, a group of men started hurling hateful insults their way. In fact, “insults” is too nice of a word – what was being said crossed every imaginable line of basic human decency. The verbal attacks kept coming. Boys within the group started to be singled out. At this point, the students couldn’t just stand there like I did at the drinking fountain. They asked their chaperone if they could chant some of their school cheers to drown out the hate. The boys started to chant while the unbelievably disturbing taunts continued. This post is not meant to be political in nature. Additionally, other than to set the context of the situation, this entry isn’t meant to criticize the mainstream media for botching the story. My only point is that those teenagers were unfairly targeted and demeaned by grown men. It is scary to be a kid and have an adult (or adults) you don’t know threatening you. It is one-sided and wrong. We need to do a better job standing up for our youth. Instead of trying to ruin their lives and smear them on national television, the students from Covington Catholic High School deserved more support than what they got. Don’t Blink. This entry was posted in Uncategorized and tagged Covington Catholic School, Lincoln Memorial, Nathan Phillips, Nick Sandmann by brent. Bookmark the permalink.